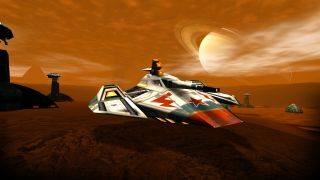 Rebellion announced in February that Battlezone 98 Redux, a remake of the hit FPS/RTS hybrid that was originally released in 1998, was in the works and would be out in the spring. And “the spring,” as it turns out, is today. The redo, developed by Big Boat Interactive, offers two single-player campaigns—one American, one Soviet—with updated graphics including “completely remodeled vehicles and buildings, enhanced lighting and shadows, improved particle effects, upgraded animations, upscaled terrain, and more.” There are also Deathmatch and Strategy multiplayer modes for 2-8 players, support for mods through the Steam Workshop, and a built-in map editor. Rebellion didn't explain why it released the game with basically zero fanfare, but it did put out a launch trailer showcasing the improvements and additions, and it also showed off the new gameplay in a livestreamed lead-up to the announcement on Twitch. To make up for the lack of a preorder period, it's also got the game on sale on Steam for $16/£12, a 20 percent discount on the regular price until April 24.